Technology and cannabis continue to come closer together as pot prohibition lessens around the country. In the past decade or so, tech has begun to pick up around the industry as well – especially in the cultivation sector. When Colorado, Washington and other states ushered in legalization, these advancements took off that much more. Today, with over half the nation adopting cannabis laws, as well as Canada’s adult use marketplace opening in October, new facets of the industry are booming and producing more clones, equipment and other cannabis cultivation options than ever before. Advancements in technology help all parts of the supply chain in today's cannabis industry. One such company is Boulder, Colorado's Front Range Biosciences. It uses modern agriculture to enhance several key facets of production for cultivators and consumers alike. Founded two years ago, Front Range launched with the "purpose of translating agricultural technology into the cannabis space or into production of a new crop," according to Co-founder and CEO Dr. Jonathan Vaught. The company's primary focus centers on breeding and genetics, the nursery part of the supply chain. From there, Dr. Vaught added Front Range’s commitment to, "...most importantly, not only the creation of new genetics but how to get those into growers' hands effectively and at industrial scale so that the industry can grow and support the increase in the demand and the just rapid growth in the market that we see." In the two years since Front Range began, Dr. Vaught already notices quite a deal of advancement in cannabis and tech. He noted that the development of pot remains in its infancy compared to crops such as corn, soy, wheat and certain vegetables. 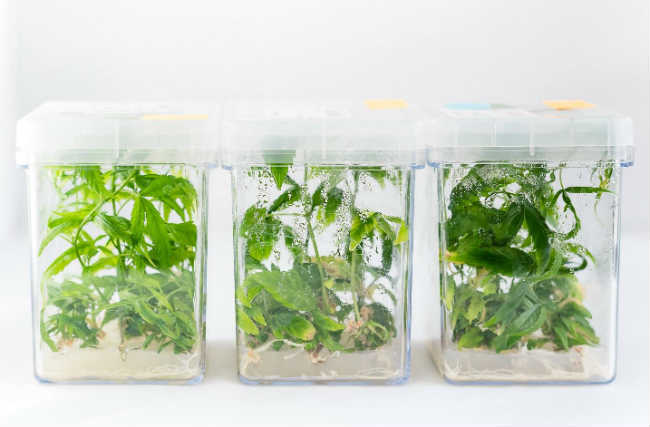 He explained, "the amount of information that was known about this crop and established in scientific literature is very small, and it's still very small." At Front Range, the company uses its own tissue culture processes and technologies developed around it to advance cannabis and industrial hemp. "That's really helped us provide high-quality nursery plants and then really scale our process effectively," Dr. Vaught adds. Front Range's technology pushed out 200,000 clones in its first year of production. Next year, it expects to reach between two and three million - and are still considered small by average horticulture standards. Beyond Front Range, Dr. Vaught recognizes the advancements underway around the industry. Among several areas, he mentioned the greenhouse space. "Some of the unique qualities of this crop and how it's grown I think have resulted in innovations in greenhouse design and large-scale production that are interesting." In addition to greenhouses, he acknowledged tremendous advancements around indoor growing." Cannabis was grown indoors primarily for quite a long time and in a lot of places because of the legality of it. That was the first place that people looked to start growing was in warehouses. I think we've seen a lot of growth in both indoor growing, whether it's LEDs and hydroponic systems and controlled environments, indoor growing pods, and all these different things that allow you to effectively grow at a competitive price in an indoor environment." Meanwhile, even the industry's most rebellious are evolving along with advancements in tech in their own ways. In the Emerald Triangle, the Northern California region known for producing some of the world's best cannabis, things are going back to old school methods. Tim Blake, Founder and Producer of the Emerald Cup, one of the premier competitions for medicinal marijuana, sustainable growing and outdoor farming, told PotGuide how cultivators are coming back out of hiding. "It's amazing to see where we've gone from guerrilla operators over the last 15 years, or 30 years, really, 40, to where we're now becoming more traditional agricultural people every day." Blake called the change "an incredible evolution." He noted that the boom began in the Emerald Triangle before Colorado kicking off America's legalization wave. A local program, the 9.31 Program, allowed cultivators to grow up to 99 plants in the sun. Two years in, the program was struck down by federal authorities. Yet, those two years showed that one of the largest tools for growing high-quality cannabis is the sun. "People really had never really thought of the fact that yeah, of course we couldn't grow good flowers because we're growing in the shade, hiding from the [authorities]." In combination with the right technology and know-how, sun-grown cannabis can be rather fantastic. Blake’s observations fall in-line with other industry assumptions that note a split between mass produced items for medical use, as well as for less particular recreational consumers, and cannabis enthusiasts. Like the Bordeaux region of France, the Emerald Triangle and cultivators spreading into other areas of the country will continue to use old era tactics while tech surges forward to carve a majority stake for itself in the sector. While the future is uncertain, the effects have been felt in the Emerald Triangle where the outlaw grower days are ending and some aren’t keeping up with the times. However, their knack for growing cannot be replaced or replicated by any machine, and that will continue to have a place in the industry for years to come. What are your thoughts on the technological advancements in the cultivation sector? Comment below!